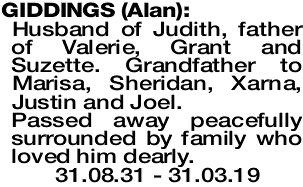 Husband of Judith, father of Valerie, Grant and Suzette. Grandfather to Marisa, Sheridan, Xarna, Justin and Joel. Passed away peacefully surrounded by family who loved him dearly. On MONDAY (8.4.2019) you are invited to celebrate the life of the late Mr Alan John Giddings at a ceremony to be conducted in the Allambie Park Chapel, 241 Lower King Road, Albany commencing at 3.00pm.